Making a fire in the wilderness amid strong winds is quite challenging. 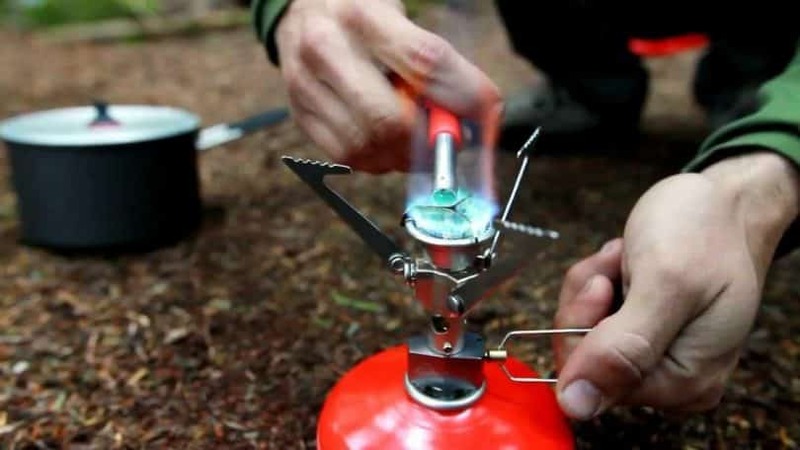 With the campfire set aside, conventional camping stoves that use convective heat with obtrusive flames are major setbacks for campers, alpinists, mountaineers or hikers because of their susceptibility to strong winds. The MSR Windburner stove is an alternative solution to outsmart those prevailing challenges of winds because of its radiant burner technology and heat transfer features. MSR Windburner was engineered with the weatherproof features in mind, as seen in the enclosed design. 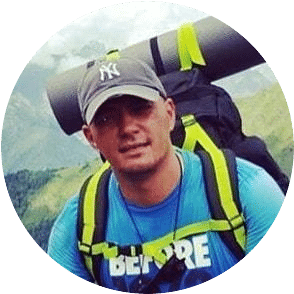 No matter how disruptive the winds are in the wilderness, this stove will remain fuel-efficient, while enabling you to boil water for your hot coffee or for the rehydration of your freeze-dried or home-dried meals. There are no obtrusive flames, unlike with the conventional stoves. Nonetheless, it burns excellently because the burner has been enclosed. It is a compact, all-in-one integrated stove and cookware system that includes a secure locking pot and personal mug with cozy. 100 primary air combustion, internal pressure regulator and enclosed design all combine to make the WindBurner completely windproof. Lid has drinking and straining ports. In addition to its great features, the Windburner stove comes with a versatile cookware because you can use it to eat in or boil water. The cookware is made with the anodized aluminum that is good in thermal conductivity. There’s no need to have a separate bowl unless of course you are travelling with a partner because the cookware is about 1 liter, which is insufficient to serve two people at the same time. There are reports that the company has launched the 1.8 liter version. We are yet to see that. For now, the larger alternative is the Reactor stove by the same manufacturer. The stove’s components are portable and can be contained inside the cookware for ease of travel. Then the top lid will cover them until your next camp stop. The 4 oz small fuel canister can also be stored in the cookware. With a weight of 1.1 pounds, it’s a breeze to pack this Windburner stove in a backpack and hit the road in no time. 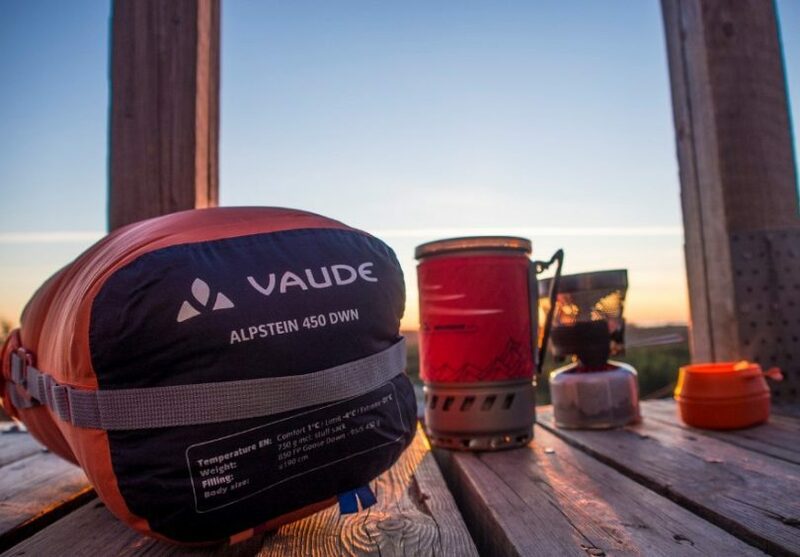 The Windburner is renowned with its compact and lightweight design that is windproof. It is an integrated camping stove that comes with a built-in cookware made of the anodized aluminum material. Aluminum is a great heat conductor, so it helps in efficient heat transfer. 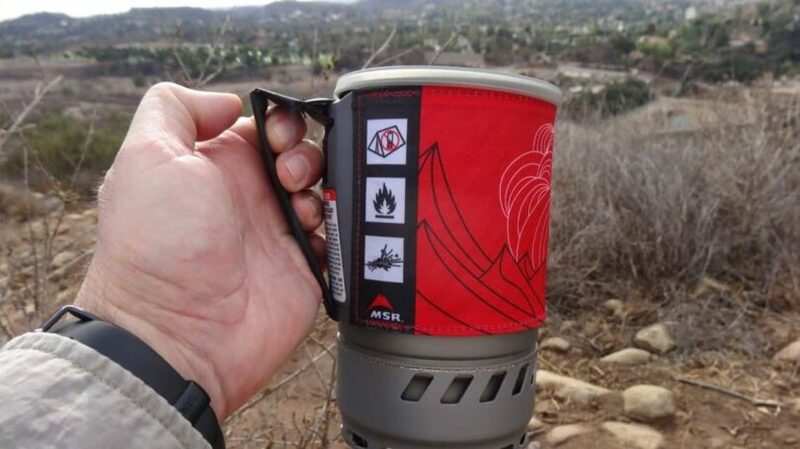 The stove includes the mug with the insulated cozy that has a handle to hold the mug. There is also a 16 oz bowl and a handle that has the same shape as the travel mug. The lid is versatile and can be used for sipping and straining options. For stability, the folding canister stand can be used to hold the stove burner. 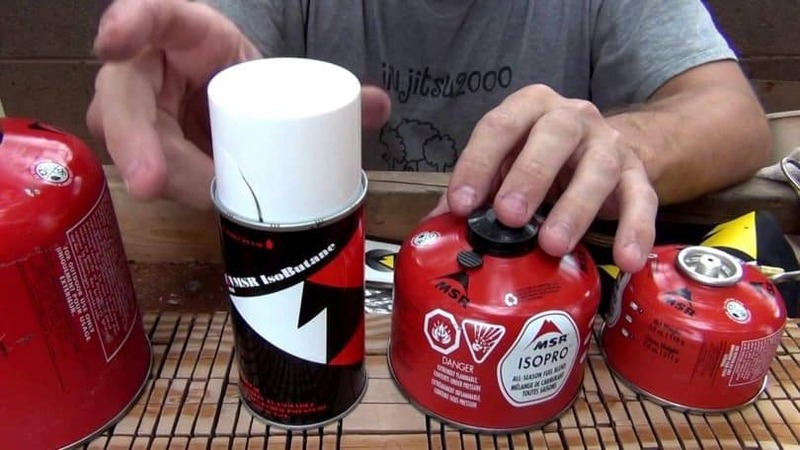 Meanwhile, the 4 oz IsoPro fuel canister can be stored in the pot because of their portable designs. With the canister, you can secure the stove, especially in uneven terrains where it can fall at any time. 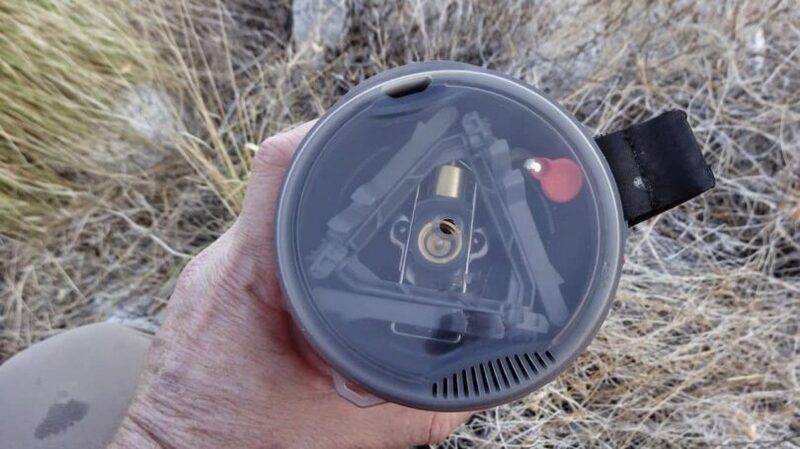 From the lid, you can drink your coffee. There is a secure connection between the pot and the burner. Meanwhile, the heat transfer fins enable the pot to remain hot even after 10 minutes of disconnecting or switching off the stove. The compatible accessories include the Windburner skillet, hanging kit, coffee press kit and the accessory pots. If you want to light the stove, you will have to manually light the burner. Note that it might be challenging at first, especially if the winds are too strong because there is no built-in self-igniter. This is the only drawback so far with this stove. You will have to cover your lighter or matchbox whenever lighting the stove to prevent the strong winds from extinguishing the spark. The cookware has some liquid markings to prevent over-filling of liquids that could mess up the stove when they boil. The included plastic cup also has markings for convenient measurements when boiling or warming fluids. For durability purposes, the anodized aluminum takes control. It is a durable and lightweight material used in many cookware products. Also noteworthy is the nonstick and heat conducting properties of the aluminum metal. It will be easy to travel with the Windburner because it is lightweight. 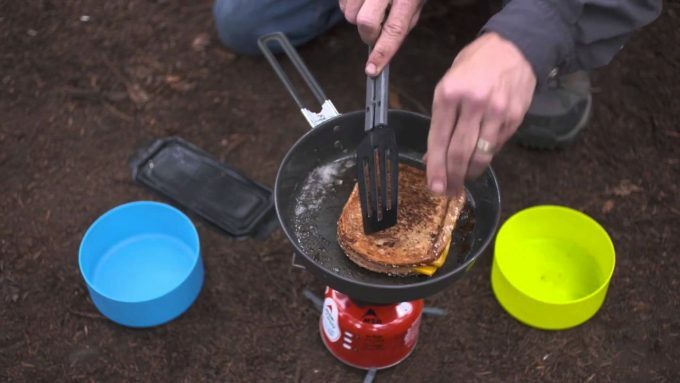 Minimalist campers will find this stove not only durable, but portable as well because it packs small. The stove comes with the 4 oz IsoPro fuel canister wherein you can fill the Isobutane propane fuel. It is easy to find this fuel in your local supermarket or gas-store. When traveling, the fuel canister can be stored with ease in the cook pot. But, if you want to get a larger one, it may not fit. This stove saves you more fuel by boiling fluids quicker than you would with conventional camping stoves. Normally, conventional stoves will consume more fuel in windy conditions and will take longer to boil even half a liter because the winds can disrupt the obtrusive flames. The Windburner burns 500 ml in less than 2 minutes, so that is fuel-efficient. With a price range from $130 to $160, this is one of the relatively expensive stoves, even more than some of the conventional stoves with more liter capacity. It has an advanced radiant burner technology that is justifying the price. 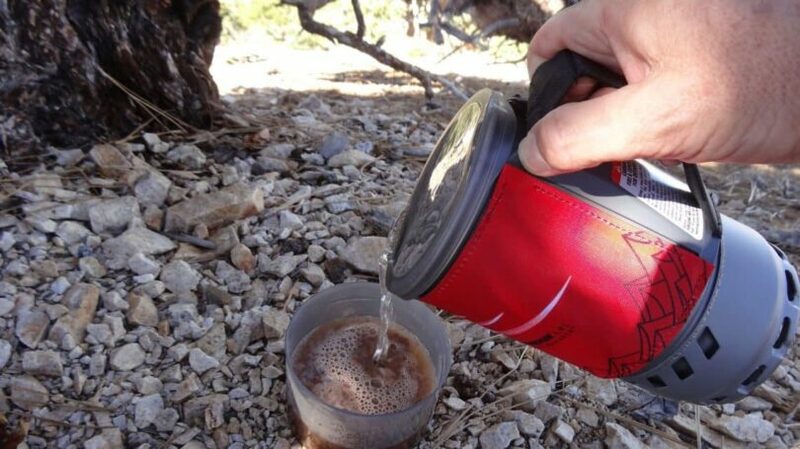 With this technology, you are guaranteed a pleasant preparation of the hot coffee in the morning regardless of the windy conditions. For an efficient cooking, you must prepare to spend more money on the accessories such as the MSR Piezo Igniter, Windburner Skillet and the Utensil set. The fuel is not included, so prepare money for that too. If you feel that the 4 oz IsoPro fuel canister is insufficient, you can consider the larger 8 oz IsoPro fuel canister from MSR. A minimalist camper may not like the idea of a larger canister. Quality is guaranteed with this Windburner stove. The manufacturer offers a lifetime warranty against any defects you might encounter. So, having this windproof stove is a good investment. But, for those travelling in groups, this stove may not be a good investment for them because of its relatively tiny size to even serve two people. Also noteworthy is that, the stove is only ideal for quick boiling of water for your coffee or for minor breakfast meals such as oats. 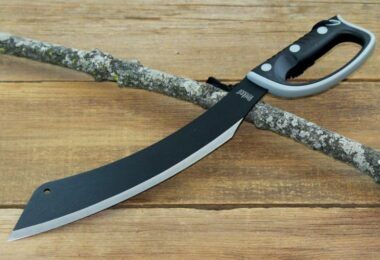 It is not for serious cooks in the wilderness. The MSR Windburner is furthermore made amazing by its unique features. It has a premium wind performance with its pressure regulator in addition to its innovative reactor technology. With these, you will be able to boil water in a “blink of an eye” in spite of the winds in the precinct of your camping tent. This is a capability that is seldom seen in conventional stoves that exclusively use the convective heat. Here are the most interesting and useful unique features, explained in details. Just like its predecessor, the Reactor Stove, the Windburner operates with radiant burner technology. The amazing thing about this technology is the fact that it is wind resistant, meaning it is seldom affected by strong winds, notwithstanding the difficulty to light the stove in those winds. It may take ages to boil water or rehydrate your freeze-dried meals with other stoves. The MSR stove with the radiant burner technology proves that wrong. Within a few minutes, your meals will be ready to serve without winds jeopardizing the stove’s performance. The other important factor to consider is the pressure regulator for its importance in expediting the performance of the Windburner stove amid wildest winds. The stove has the ability to regulate pressure efficiently, even when the fuel canister has been almost depleted or camping in cold weather conditions. So, the efficient pressure regulation, plus the fuel efficiency, are the unrivaled capabilities of this stove. You therefore do not have to buy so much fuel in order to burn this stove. If you are on a budget and often camp in windy conditions, this Windburner stove is ideal for you. Some people are tempted to ditch out the canister stand to save more weight. This is, however, discouraged, especially when you camp in uneven terrains because you might break your precious windproof stove. If your camping surface is even, then that will not be a major issue because the stove can stand on its own. With the stand, you can secure the stove in a tight position. The main aim is to use the stove in windy conditions when others fail. So, it’s likely that, without the canister stand, it can fall. When you want to pack to another location, the foldable canister stand comes to your rescue. You can easily fold it to store in your backpack. When ditching it, beware of the surface on which you put it because it might be broken with ease. All the components should not be hot, otherwise you risk being burned. The bowl and the cookware are heat resistant so that you can handle them well. The pot’s cozy is insulated, so there are no anticipated burns in case you handle it. Of course, you might need to constantly stir the contents in the pot that’s why the components should be heat resistant. The bowl is also heat resistant. Other components are not heat resistant. Warning should be exercised when dealing with this stove because of its invisible flames. Minutes after you have lit it, there might not be signs that it is hot, but in actual sense it is hot. Do not touch the mesh discs to test if it’s indeed hot. Moreover, the heat transfer fins, are not be touched as well, even after a few minutes of switching off the stove. They can absorb heat that is meant to keep the cookware warm for about 10 minutes. Should you need to exchange the fluid contents, you must switch off the stove. 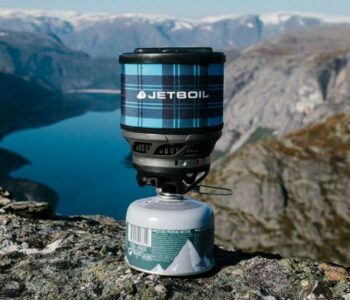 The Jetboil Flash Personal Cooking System is a potential competitor of the MSR Windburner. It has a 1 liter FluxRing cup, with the insulating coating, for ease of handling, the same way MSR Windburner does. The cozy has a color-change temp indicator to alert you if your fluids are efficiently warmed. 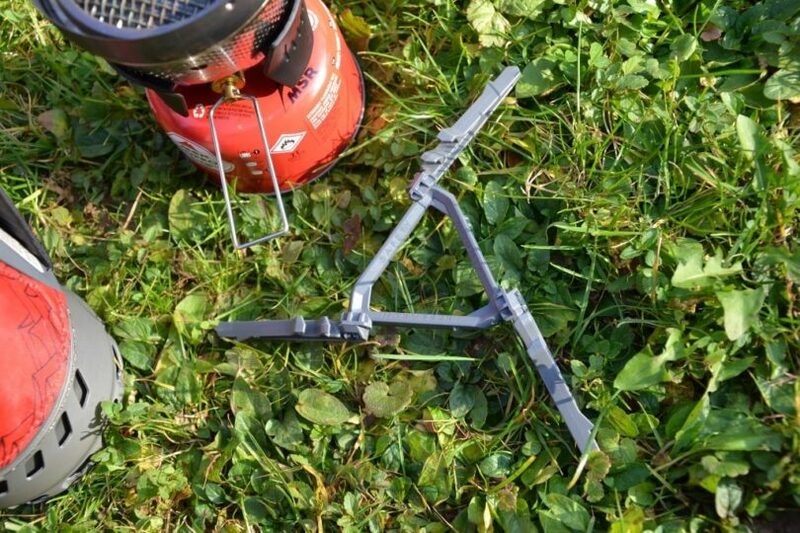 To make it stable, the tripod is included so you can even use the stove on uneven terrains. To light this stove, it’s easy with the adjustable burner with the built-in igniter design. On the other hand, the Windburner has not built-in igniter. This personal stove is more suitable for two persons because it can cook 2 cups in 2 minutes. The cooking cup is also made of the anodized aluminum for durability, thermal conductivity and lightweight design for high performance of cooking. The fuel canister is sold separately for this stove. Even the other accessories offered by the manufacturer are sold separately. 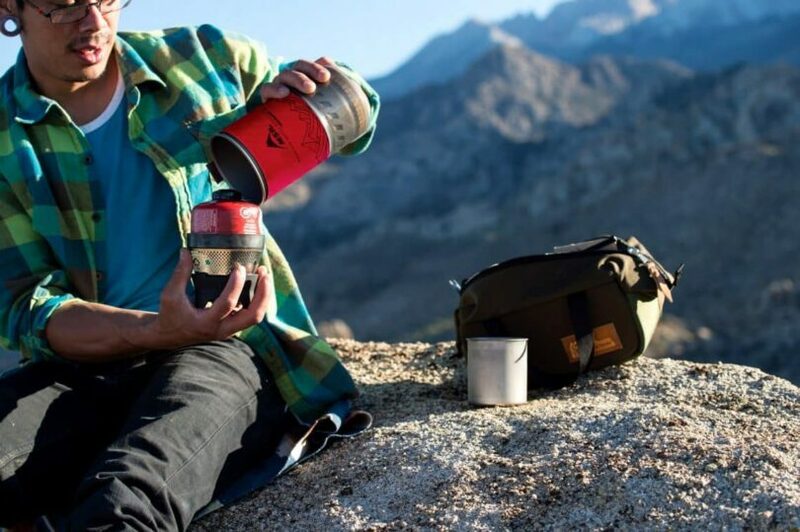 With the fuel canister, you can boil up to 100 cups during your camping duration. Most of the features between the MSR Windburner and the Flash stove are identical because they are common among the wilderness enthusiasts. However, the Jetboil Flash doesn’t come with the pot support. You may have to purchase that separately. The FluxRing cooking cup of the Jetboil is also large and accommodating enough to store the fuel canister and the burner for ease of travel. Price wise, the Jetboil Flash is much cheaper at less than $100, whereas the Windburner costs over $120. 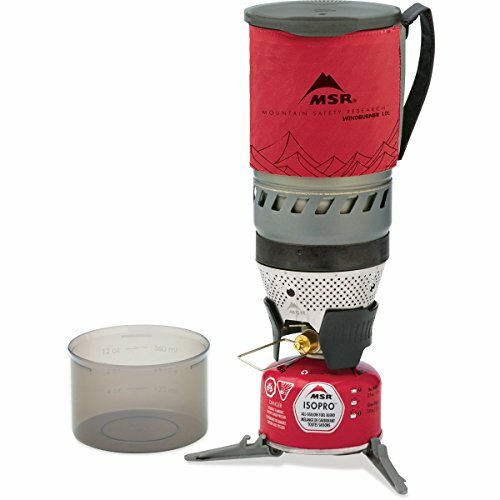 The MSR Reactor Stove is a similar model because, despite being from the same manufacturer, it serves as the predecessor of the Windburner with the same radiant burner technology. It is suitable for partners in the wilderness because of its relatively larger cookware of 1.7 liters. It can also serve up to 3 people. A 1 liter can boil in less than 3 minutes in spite of the strong winds because of the powerful and effective enclosed radiant burner. The burner is highly effective in windy conditions. The Reactor stove weighs 1.5 pounds with dimensions 8 x 6 x inches. It is lightweight enough to be packed by any minimalist hiker. The packed weight is 2.1 pounds, which is still reasonable. A total of 22 liters of water can be boiled by the 1 oz of IsoPro fuel. Unfortunately, this stove can only be shipped within the United States. For those looking forward for a serious meal cooking, this stove is relevant. It has an approx. boil time of 80 minutes. On the other hand, the Windburner is for solo travelers, and the Reactor stove for companions. It is an advanced stove as also justified by its expensive price range from $180 to $220. We would recommend you get both of them because they are indispensable. 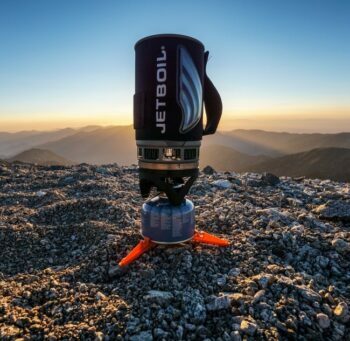 The Jetboil MiniMo Personal Cooking System is another competitor of the Windburner. The first attraction of this stove is its simmering capability. The Windburner is, unfortunately, not a good stove for simmering purposes. 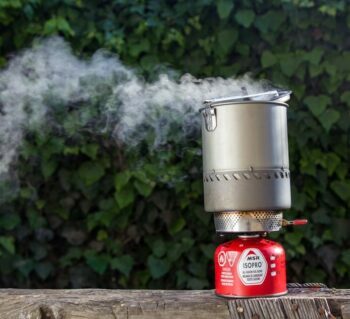 This Jetboil MiniMo stove is made of a sturdy metal handles that help you handle the pot with ease or eat from it. There is a push-button igniter with which you can light the stove easily. The insulating drink-through lid and measuring cup is also included. There is a lower spoon angle to help you eat from the pot without the need to bring a separate bowl. With the well-engineered valve and regulator, you can simmer meals. When cooking in the wilderness on an uneven terrain, the fuel canister stabilizer will hold the stove securely. This stove is ideal for those seeking to cook serious meals in the outdoors. It has the option to simmer, unlike the Windburner. Its price tag is about $140, and it has advanced features that every outdoor needs. However, the Windburner has an advanced radiant burner technology that outsmarts the Jetboil MiniMo stove with windproof capabilities. 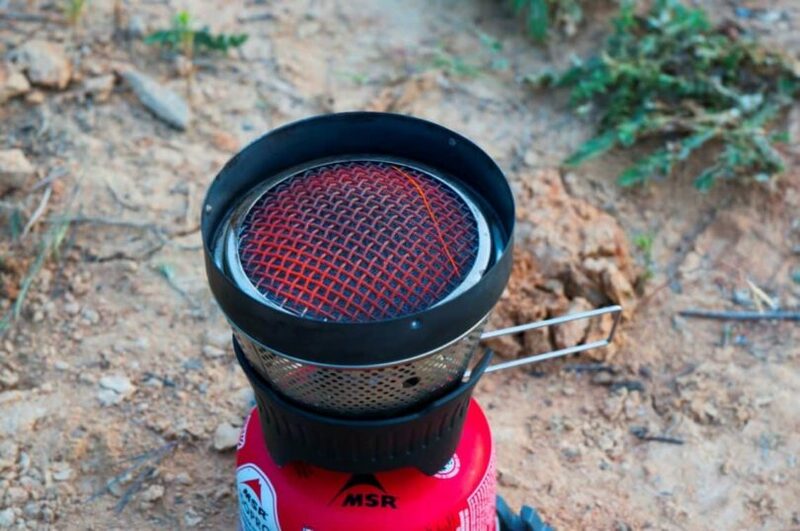 The MSR Windburner is a stove of choice for solo travelers. The MSR is renowned as the best manufacturer of radiant burner technology tools as seen in the preceding Reactor stove. The Windburner builds up from its predecessor with the technology. It is the same technology that makes it suitable to be used in windy conditions, so those worried about the wind fluctuations of their camping site, it is recommended that they consider this stove. 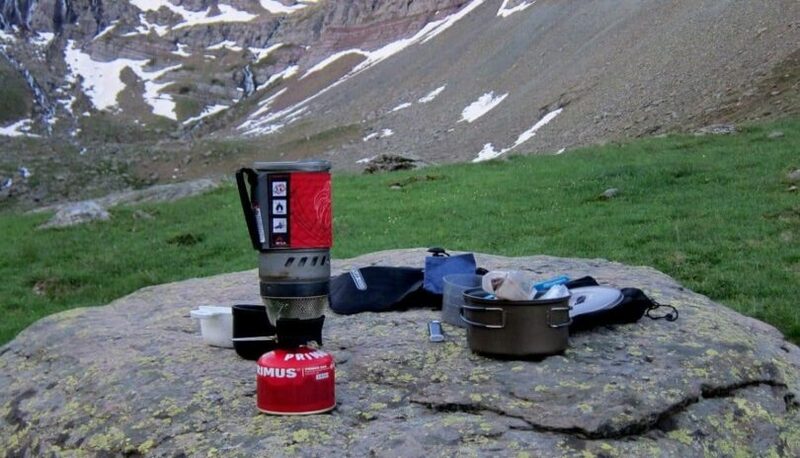 It could be stressful to wake up to a freezing temperature in the morning in the wilderness, while you do not have an alternative solution to make a hot coffee because the campfire could be disrupted by the winds at 12 mph. The Windburner comes equipped with all features you would as the enthusiast camper. The built-in cookware is made of the anodized aluminum, which is lightweight and durable. It provides great thermal heat conductivity, so boiling coffee with this will take a few minutes. Operating this stove is an absolute breeze, although, the challenge could be lighting it because of the absence of the built-in self-igniter. Once lit, you can secure the pot easily. The heat transfer fins underneath the burner helps keep food warm for long. Radiant burner technology to survive strong winds. Heat transfer to keep meals warm even after 10 minutes of switching off the stove. Top lid for straining and drinking. Boils water in less than 3 minutes. Too small to serve more than one. It gives a great feeling to cook your morning cereals in this Windburner stove, but becomes a tedious task to clean it up. Cleaning is not a matter of using abrasive soaps and scrubbing the cookware. Keep in mind that it is made of the anodized aluminum, which is allergic to scrubbing. If it has a nonstick coating, it could be hurt by scrubbing it. The included square cloth should be used to clean the cookware. Keep in mind that this Windburner stove is suitable for boiling water or rehydrating freeze-dried meals. If you want complex cooking, we recommend considering the Reactor stove. Camping in the wilderness should no longer be stressful for you if the wind fluctuations have always been the downside. We have provided you the best solution for that. The Windburner stove was specifically designed to be windproof with its radiant burner technology and heat transfer fins. Although it seems expensive, the price is worth an investment because the outdoor temperatures can be unpredictable. You cannot choose to struggle from the winds when the best solution exists. MSR Windburner appeals to many outdoor hobbyists because of its superb windproof features. 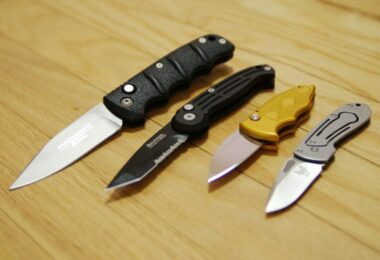 It is compact and lightweight, so packing it, will be a cinch. The selling point of this stove is the patent-pending Reactor technology that the company is proud of as it outsmarts lots of conventional stoves that rely on convective heat. For those in a hurry, this stove is suitable because it burns 500 ml of water for your coffee in less than 2 minutes. The wind has no effect on your cooking time. The burner is enclosed and the flames are not visible. Have you ever used this windproof stove before? If yes, please share with us your experiences below. You can also advise our readers about the typical meals to cook in the included anodized aluminum cookware.